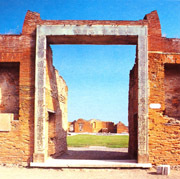 Meeting with your private English-speaking guide by the main entrance (Porta Marina gate) of Pompeii ruins. Enjoy a real journey in search of an ancient civilization destroyed by the terrible eruption of Vesuvius in 79 A.D.
Pompeii is one of the most significant historic vestiges of the Roman civilization and it appears as an exceptional open book on the art, customs, and crafts, of the everyday life of the time. Visit the Pompeii ruins on foot for approximately two hours and half with a English-speaking guide on a magic journey through the ancient city. Through the ruins of this ancient city, You can imagine the everyday life of the Roman Empire and imagine the panic felt by the people in those last few minutes before the city was so disastrously buried. The volcano buried the city under many feet of ash and it was lost for 1,600 years before its accidental rediscovery. THE PRICE OF THIS PRIVATE TOUR OF POMPEII IS NOT BASED ON THE NUMBER OF PARTICIPANTS. THIS GUIDED TOUR COSTS EUROS 180. When You book this guided tour with us, check the best time of the day with the Tredy Company for the visit of Pompeii tour in order to avoid the numerous tourists coming from the cruise ships..